Here’s your BeerBods cheat sheet for Three Hundreds Dark Old Ale by Chiltern Brewery. Featured in BeerBods main subscriber box on 30 November 2017. Find the brewery on Twitter at @Chiltern_Brewer and on Instagram at @chilternbrewery. Serve this beer at ‘cellar temperature’, or 10°C to 13°C. This means about 40 minutes in the fridge, and possibly up to an hour if your beer has been stored somewhere warm. As ever, be wary of over-chilling your beer. More chill means less flavour. I have a recent post on recommended serving temperatures and why they matter if you want to learn more. We’re hoping for a complex beer here. Expect big malt notes with toffee, nutty, and bready sweetness balanced out by some traditional English hops. In this case it’s the classic pairing of Fuggles (grassy, minty, earthy) and Goldings (spicy, honey, earthy). There may be raisiny dried fruit notes, perhaps even some coffee, chocolate, or liquorice. It should be full-bodied, robust but balanced. It’s a big beer so it can stand up to big dishes such as roast meats and rich desserts. If you fancy something lighter, try it with some Double Gloucester cheese. It should work well with a mince pie or some fruitcake. 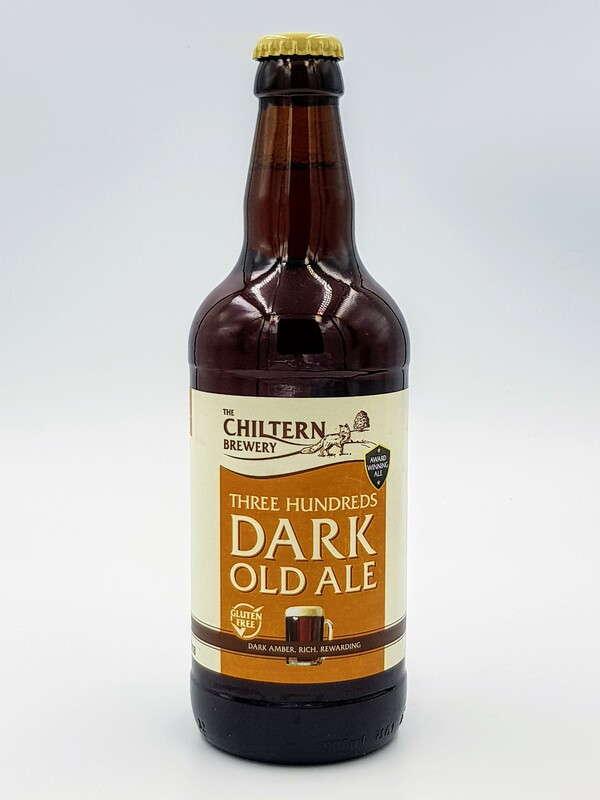 Read more on Three Hundreds Dark Old Ale from BeerBods and the Chiltern Brewery.